Relentless Financial Improvement: Can you have too many credit cards? I’ve written before about how one should always pay with a credit card whenever possible. The protection and benefits that credit cards offer far outweigh any benefit from paying with cash or debit cards. I currently have 9 credit cards in active use, and sometimes people are surprised and shocked to hear about it. I rotate the my credit card usage heavily depending on which card offers the best rewards cash back or bonus points. Some cards like the Chase Freedom card or the Citibank Dividend card offer rotating cash back categories. (I would not sign up for those cards right now since the sign up bonuses aren't very good right now. Promotions should improve the bonus in a few months). Currently, I am earning 5% cash back / 5x points on every purchase that I make for the next 6 months (credit card promotion). It’s like carrying a 5% off coupon in my wallet, but better, because the points that I earn can be used for free travel and vacation. Reuters recently had an article mentioning how Vitaly Pecharsky, the CTO of slickdeals.net has 40 active credit cards in his possession! This is a man who has optimized spending to get $2000 to $3000 a year in rewards and cash back. According to Experian, consumers have an average of three cards and only 15 percent have more than seven. Credit utilization is the ratio of balances owed (debt) compared to the credit limit available. This utilization is calculated for each credit card you have as well as all of your total credit. The lower the utilization, the better your credit scores. This is important because your credit utilization counts for 30 percent of your credit score. The higher the utilization, or the more of your available credit that you’re using, the more negative the impact on your score. 3. Open a new credit card. Remember, ALWAYS make purchases that you can afford and NEVER carry a credit card balance. Carrying a balance will negate any rewards and points you earn from your rewards credit cards. Closing a credit card also closes that credit limit from the overall utilization calculation. Many people who’ve had credit card debt in the past think that after they pay off a credit card, it's best to close the account. The opposite is true, it’s best to keep the card and use it once in a while. Another option is to convert the card into a better rewards card, that you have a higher likelihood of using. You might think that having only one credit card keeps your life simple. The downside of having just one credit line is that you probably aren’t getting the most cash back for your regular spending. Also, if you were to lose your card or get the number stolen by fraudulent activity, you would be unable to make any other purchases until you receive a new card a few days later. “A bigger problem is applicants for mortgages are individuals who don't have at least three "trade lines" - credit cards or auto loans - to establish a strong enough history”, says David Boone, first vice president and head of mortgage origination for The Provident Bank. “Someone with a lot of lines and a lot of available credit who has kept usage low and maintained a solid history of payment is a good candidate for a mortgage." The amount of unused credit that you have is valuable. Having additional credit cards decreases your credit utilization and thus improves your overall credit. You can read about other ways to improve your credit score here. It's a common misconception that applying for multiple credit cards or using multiple credit cards is always bad for your credit score. In many cases, having a diversified mix of credit can actually be good for your credit report. Be careful, each new credit application you make results in what's called a hard inquiry on your credit report. Each hard inquiry can lower your credit score by 5 points. This hit to your credit score is temporary, and your score will improve after a few months. After 1 year, the hard inquiries are no longer important to your credit score. The general rule is that applying for a reasonable amount of credit is fine, but one should refrain from applying for new credit 6 months to 1 year in advance of any auto or mortgage loan. Lastly, you think the guy with 40 credit cards is incredible, take a look at this article describing Walter Cavanagh, the man who owns the most credit cards. 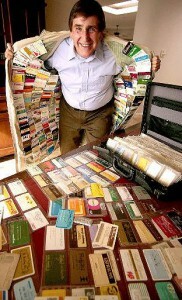 He has a total of 1,496 active credit cards with a credit limit valued at $1.7 million! He has been dubbed “Mr. Plastic Fantastic” by the Guinness Book of World Records since 1971. Well a good information overall but having multiple credit cards means you should use them wisely otherwise there is always a chance that user may run in heavy financial debts. However, using wisely and going with the best reward program are some benefits of this theory.